Amsec wall safes are designed to provide hidden protection for documents and miscellaneous valuables. Each wall safe is also designed for easy installation between 16″ o/c wall studs. Pre-drilled anchor holes and a built-in flange eliminates unnecessary re-plastering. Please note the depth on this safe before purchasing. Call us if you have questions. 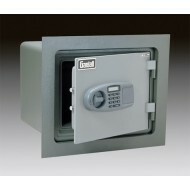 Gardall insulated wall safe WMS911-G-CK is one of our most popular safes. These models are insulated with a fire resistant substance and have received a 1 hour KIS rating. 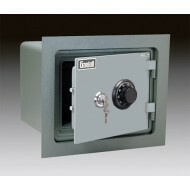 These Gardall wall safes are also designed for easy installation between studs in standard 2" x 4" (16/oc) construction. The WMS models are manufactured and shipped in two pieces. Your biggest box will contain the safe body (MS911) and the smaller box will have the flange. We will not accept returns because you have not read about the two separate pieces here. Gardall states that keeping the flange a separate piece ensures that the safe will fit well in any standard construction. You will be drilling the flange where you want in order to secure it to the wall studs. Do not order this model if you are not handy with a drill. Also the flange is most vulnerable to damage in shipping, so is boxed separately with extra packaging. The safe body will look like a typical free standing safe until the flange is bolted to it. Please note the depth on this safe before purchasing. Also note a flush mount install will add two (2) inches to the depth. Call us if you have questions. Note the Electronic lock style has changed on the Gardall microwave safes. Please see all images before purchasing. Everything else about these safes is the same except the lock. 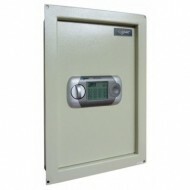 The Gardall insulated wall safe WMS911-G-E offers you quick and easy access. These models are insulated with a fire resistant substance. These Gardall wall safes are also designed for easy installation between studs in standard 2" x 4" (16/oc) construction. Gardall Wall Safe WMS119-G-CK comes with a KIS one hour fire rating. 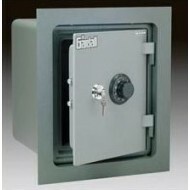 It is a heavy duty safe with two plated locking bolts, heavy steel plating and interlocking bolts. This is a good practical safe with burglary and fire protection features. In addition, a wall safe can be easily concealed. The WMS119-G-Ck comes with a separate flange. The safe body and flange will arrive in separate boxes. There will be complete installation instructions included. Bolt down hardware is also included. You will need to be handy with a drill to install this safe. It is constructed to fit easily in 16 in. on-center studs. Gardall WMS119-G-E insulated wall safe has a KIS one hour fire rating. Two plated locking bolts, heavy steel plating, and interlocking bolts will keep your contents secure. 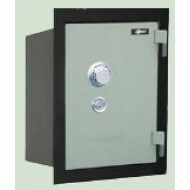 In other words, this safe has both burglary and fire protection and is easy to conceal. The safe comes with a separate flange. The safe body and flange will arrive in separate boxes. There will be complete installation instructions included. Bolt down hardware is also included. The safe is designed to fit easily into 16" on center studs and will require a drill. Keep your valuables secure with Gardall wall safe model. With a one hour fire rating U.L., your contents will remain intact for up to one hour in the event of a fire. All safes come with plated interlocking bolts which extend into the walls to prevent door removal. The doors are built with on heavy duty hinges and open fully if installed correctly. Comes with a removable shelf to help customize your storage options. The wall safe comes standard with a combination lock. A programmable electronic lock can be ordered at extra charge. Safe is painted in a powdercoat grey for extra durability. Please note the flange for the wall safe is shipped separately. It is best to wait for both boxes and the installation instructions to arrive before beginning installation. Keep your valuables secure with Gardall wall safe model. With fire rating from U.L., your contents will remain in tact for up to one hour in the event of a fire. All safes come with plated interlocking bolts which extend into the walls to prevent door removal. The doors are built with precision and open fully on heavy duty hinges. Comes with a removable shelf to help customize your storage options. The wall safe comes with a programmable electronic. Safe is painted in a powdercoat..